Alice Kim’s story reads like a pitch line for a new reality television series. Growing up back east she began cultivating an intense interest in Omaha of all places, and her fascination grew more acute with each encounter she would have with someone from this Midwest city. She never visited here, mind you, she just read about it and kept running into Omahans, and every encounter and exposure reinforced in her mind this idealized version of Omaha as the embodiment of the All-American city. The thing is, her magnificent obsession didn’t wane after she carved out a career in New York City’s fashion and style industry, primarily as an editor with InStyle magazine. In fact, she kept cultivating this fixation and then one day she left her life and career in the Big Apple behind in order to transform her life in the middle of the country, far from the tastemaking and trendsetting scene of New York. The following story and sidebar for The Reader (www.thereader.com) describe how Kim has transferred her fashionista sensibilities to my hometown of Omaha and reinvented herself at the same time as a first-time mom and soon to be bride. Her fairytale life change is the subject of her delightful blog, Postcards from Omaha, and of a book she hopes to complete by year’s end. There’s a nice symmetry to her story as well: Now that this accessories maven is well ensconced in Omaha with her lifestyle boutique, Trocadero, she’s helping prepare young Nebraska women with designs on having career sin fashion and style in New York City realize their dreams. Alice Kim’s story of leaving New York City for Omaha has gotten much play. 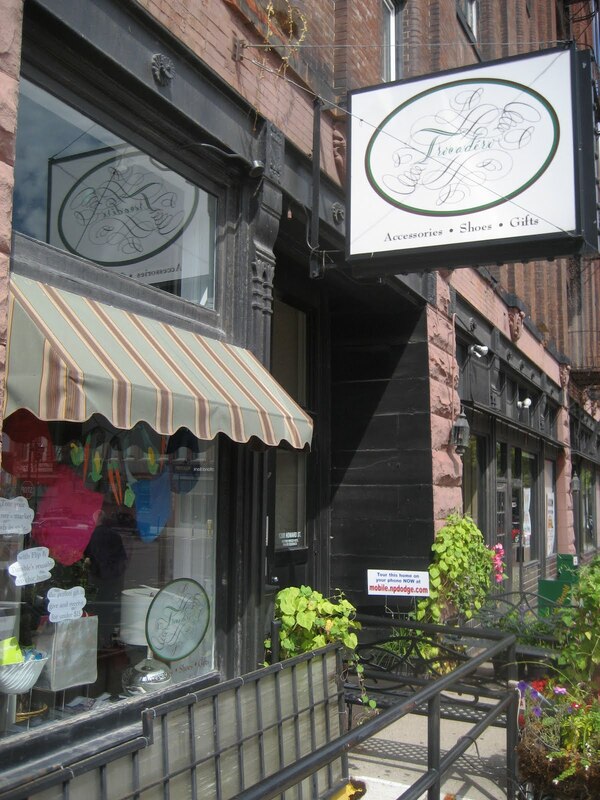 In 2007, the then-InStyle magazine accessories editor acted on her admittedly “weird,” long-held preoccupation with Omaha by moving here and opening the Old Market lifestyles boutique, Trocadero. “My store is in some ways InStyle come to life,” she says. Her experience recommending the best of this or that gives Trocadero customers the benefit of her branded, expert, insider’s advice. Still, her store has struggled amid the recession and conservative Midwest buying habits that don’t mesh with her somewhat frivolous merchandise. Cognoscenti, however, regard this Big Apple sophisticate as a style maven and tastemaker. Her exclusive, discriminating suggestions for just the right hand bag, pair of shoes or home decor item is heeded. She cops to not being a salesperson but says, “I can always convince somebody that this is a great something or other.” Her spin, she says, goes something like: “’It’s a total New York brand, it’s not sold everywhere, it’s at a great price point.’ And all of a sudden there’s a story and they’re like, Really? And they buy it. She has the professional chops and personal élan to articulate her discerning aesthetic without sounding smug, whether selecting things to sell in her shop or for her own wardrobe or excising the dull dross from a client’s closet. She’s a long way from doughty today, though she felt that way while pregnant last year with her first child. Since the birth of her daughter Annabel she’s pined to retire her formless maternity clothes and return to some chic wear, such as the classic black dress she wore at lunch, accented by pearls. “I don’t want to look messy anymore,” she says. Kim is marrying Annabel’s father, entrepreneur Adrian Blake, this summer. She’s also step-mom to his two children as the two households recently merged. Even before her pregnancy, Kim says she’d gotten lazy about her look and gained weight thanks to Omaha’s more sedentary lifestyle. Actually, she says her casual phase began near the burned-out close of her frenetic New York career. “There were times when towards the end of my working days I just didn’t care anymore. I was just so busy. I’d wear flip flops because I was hoofing it all the time, walking from the garment district back to the office with bags of accessories. I wasn’t going to teeter in high heels. Then there were those times, she says, “when I wanted to get dressed up, so then I’d wear a beautiful jacket with a dress and heels. It really depended on my day. If I knew I was going to be in the office all day then I would wear something nicer because I wouldn’t have to be schlepping around town for shoots and samples. For a year she bought her clothes at Target as a concession to mommy practicalities. Besides, she says, good style “doesn’t have to be super expensive.” Balancing being a new mom and fashionista at 41 means remaking herself, so she’s back to shopping at Von Maur to outfit herself more appropriately. “I’m in my 40s — I really can’t keep dressing like a teenager. It’s just having to embrace that I’m an adult. I feel better now because I have grown-up clothes. I can look equally fine walking to the kids’ school or coming to lunch here or going to the supermarket. Her lifetime hunt for the perfect black leather motorcycle jacket continues. Making one’s self or home polished, she says, is all about investing in a few high quality things and making them pop with the right accessories. Her magnificent obsession is the subject of her blog,” Postcards from Omaha,” and a book she hopes to finish soon. Trocadero is located at 1208 1/2 Howard St. in the Old Market. For more information call 402.934.8389 or visit shoptrocadero.com. With all the fabulous things Alice Kim ‘s done in New York City and now her entrepreneurial foray in Omaha, she says what she’s proudest of is helping people. The fashion business is all about networking, and Kim worked hard cultivating and nurturing relationships with designers, photographers and publicists. At Trocadero she’s parlayed old contacts and made new ones. She’s also availed herself as a go-to resource for young people with designs on their own NYC fashion careers. Several area women who came to her with their aspirations ended up as Trocadero interns. Each is now pursuing life in the Big Apple. They credit “Alice’s Fashion Finishing School” with preparing them. “Alice’s influence continues to impact my life,” says Kathleen Flood, an associate editor and blogger with The Creators Project. “When I was working for her, she was not only a boss and mentor, but a friend, and even an older sister figure at times. “She definitely expanded my vision of success … and has truly guided me to where I am today,” says Ellie Ashford, a freelance public relations assistant at Polo Ralph Lauren. They all refer to doors Kim helped open for them. The Omaha transplants say they’re keeping a pact to stay connected.